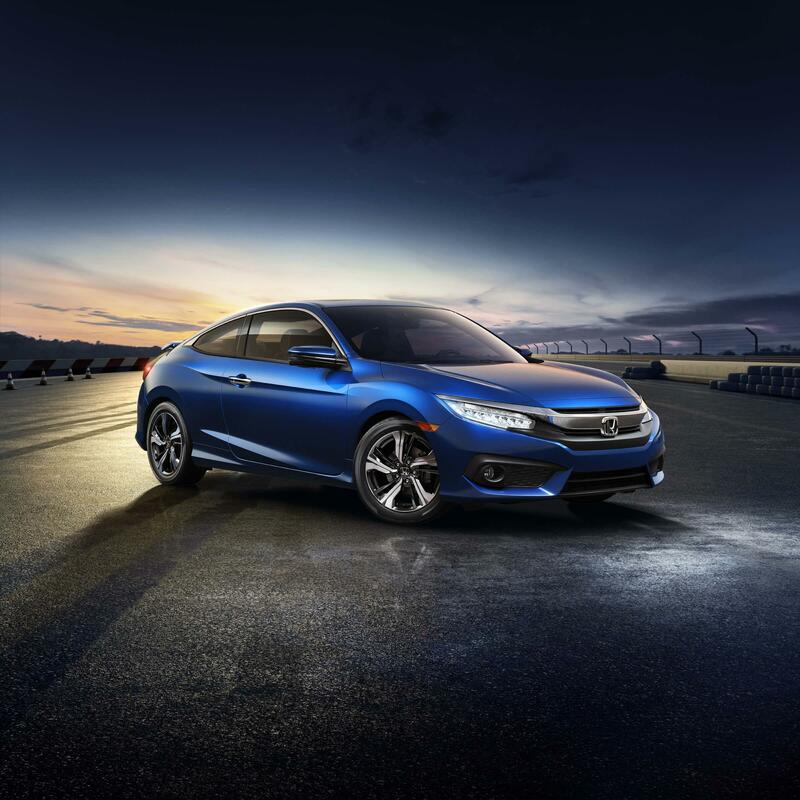 The 2016 Honda Civic Coupe is the latest version of what can only be considered to be one of the auto industry's truly enduring success stories. It's been in production in one form or another since as long ago as 1972, and it's as popular here in the U.S. and around the world today as it's ever been. The 2016 model is the first of what is now the tenth-generation of this phenomenal car, and this compact coupe is now even better than it's ever been. To the uninitiated, the 2016 Honda Civic Coupe could be seen as something of a small, relatively inexpensive car for those buying on a budget, but there's so much more to it than that it would be a shame to not take a closer look. Especially in its coupe form, the all-new Civic has daring looks, turbocharged power for the first time, and a spacious interior full of the latest tech for you and your friends and family to enjoy. The Civic lineup is totally redesigned for 2016, so just about everything about it is new this year. The Japanese automaker definitely seems to have realized just how important fabulous styling is to attract buyers to the great engineering of a car like this, and the 2016 Honda Civic Coupe is bound to win over a fair number of buyers well before they ever get behind the wheel. The Civic Coupe is now one of the sportiest, sleekest, and most appealing designs in the segment. At the front of the car there's a strong band of chrome framing the grille and headlamps and knitting everything together very nicely indeed. The sporty credentials are further reaffirmed with slits, intakes, creases, and a plethora of different textures and colors that include black, metallic, and body-colored trim. Once you get beyond the stunning exterior of the 2016 Honda Civic Coupe, the good news just keeps on coming. There are now five different trim levels to choose between, which start off with the entry level LX and progress upwards through LX-P, EX-T, EX-L and Touring. The standard engine with LX and LX-P trims is a 2.0-liter four-cylinder unit that comes paired to a standard six-speed automatic transmission and develops 158 horsepower and 138 lb.-ft. of torque. However, the unit that's really caused a stir is a new 1.5-liter option that's the first turbocharged engine to find its way into the Civic. It produces 174 horsepower and as much as 167 lb.-ft. of torque, and it's available with either the manual or the CVT transmission that's standard with LX-P, EX-L and Touring models. All versions of the 2016 Honda Civic Coupe come very well equipped as standard, but the top level Touring trim really does edge towards genuine luxury. It includes as standard features such as the HondaSensing safety suite, a power front passenger seat, heated outboard rear seats, navigation, LED headlights, a 450-watt premium audio system and plenty more.